Sometimes I wonder if I’m the only one that loves brussels sprouts because I know a lot of people think they are boring and dull. Personally, I think they are truly underrated as a side dish. 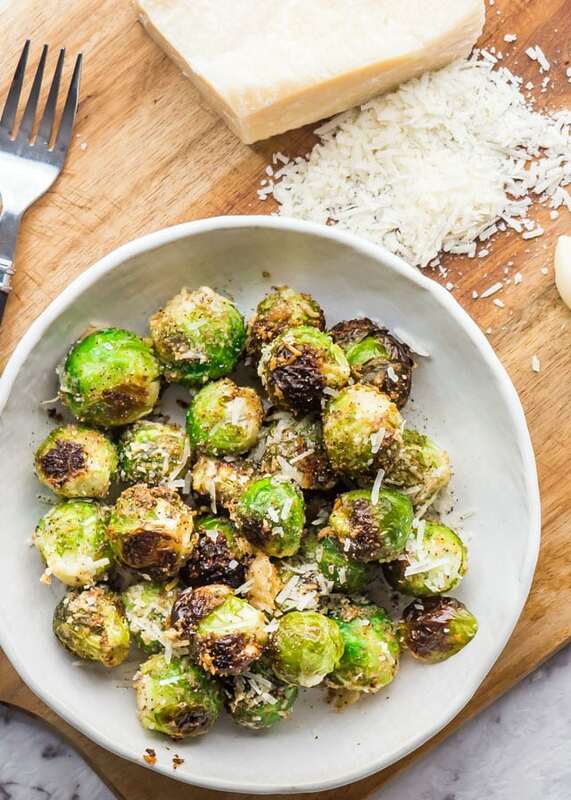 There are so many ways to prepare them, but my favorite way to serve them are roasted and loaded with garlic powder and parmesan cheese and drizzled with a good olive oil. I like to roast them for about 15 min at a pretty high temperature just until they start to brown, the browned pieces are my favorite and I usually pick them out first and snack on them. 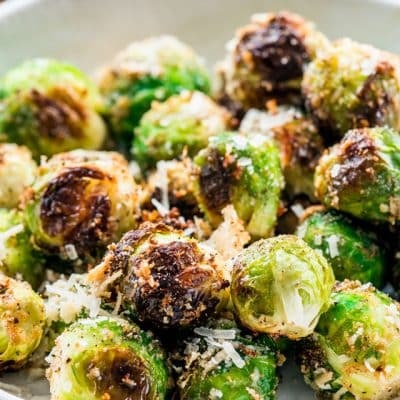 I know there are a lot of brussels sprouts recipes around that are loaded with bacon bits or toasted nuts, and although I’m the first to say that bacon makes everything better, I wanted these brussels sprouts to be the star here and to only focus on them for a change. I thought the bacon would add too much richness and heaviness to them, so I decided on garlic and freshly grated parmesan cheese as the only additions to my star ingredient. 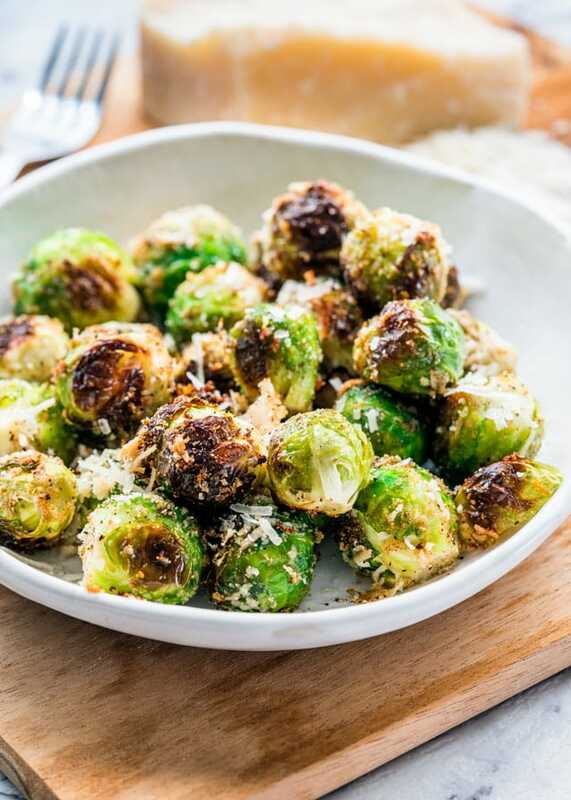 Anyway, these are brussels sprouts just like I like to eat them, baked to a crisp perfection, garlicky and salty from the parmesan cheese. While they are a perfect side dish and a great addition to your holiday table, I personally just love to snack on them just as they are. You may also choose to cut them in half before actually roasting them, but my brussels sprouts were already quite baby sized, so I left them whole. What more can I tell you? These roasted brussels sprouts were absolutely phenomenal and these cute tiny cabbage-heads are quickly becoming one of my favorite vegetables. Vegetables can be so delicious! 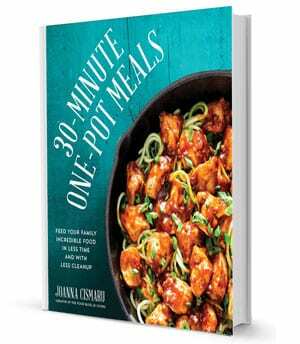 Try some of my other recipes to see how amazing they can be. Clean the brussels sprouts by rinsing in cold water, cutting off the end of the stem, and discarding it. 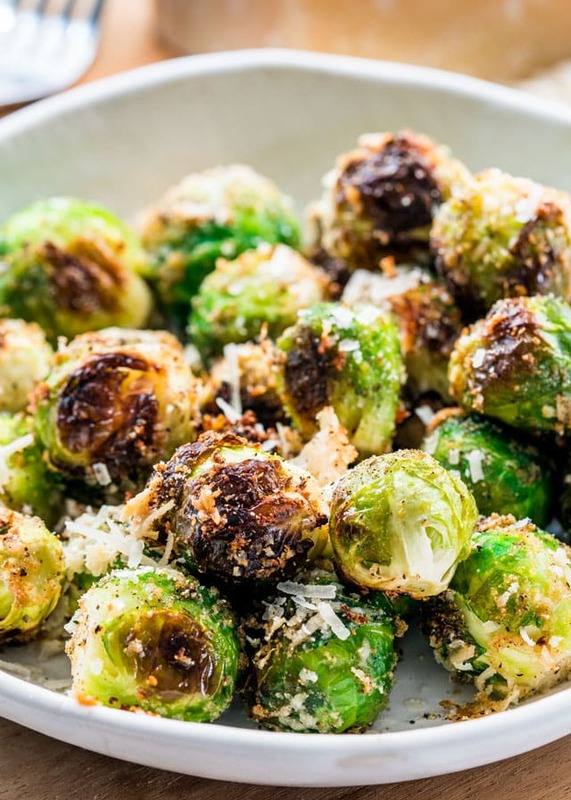 In a bowl and mix brussels sprouts together with the olive oil, garlic powder, salt, and pepper. Transfer to a baking sheet and sprinkle with parmesan cheese. Bake for 15-20 minutes. Sprinkle with more parmesan cheese if preferred and serve warm. If you don't have access to fresh Brussel's sprouts, you can use frozen ones. Make sure you let them thaw completely before beginning. I use the garlic that I grew in my garden, and that takes it over the top! I gave the recipe to a neighbor of mine and know she will love it. So glad you liked it Debbie! 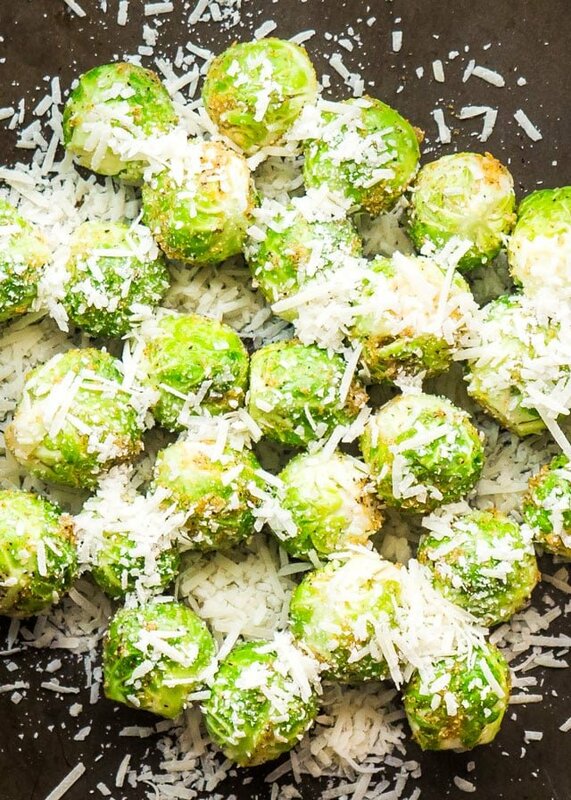 I always thought Brussels sprouts were the grossest things ever, UNTIL I tried this recipe. I loved this so much, I ate the entire bowl and wouldn’t share it with anyone else! YUMMY! I would use the oven so that you still have some crisp roasty bites! If using frozen, would the baking time remain the same? Thanks! No, it would take longer, probably 30 to 40 minutes. I used brussels sprouts that had been frozen and I just thawed them for a bit. I can only get frozen Brussel sprouts. Will the recipe for come out the same? Yes, just thaw them out first, they shouldn’t take long at all. These look and sound delicious! I think Adina is correct — too many people don’t know how to cook veggies. I used to hate asparagus until someone fixed it for me lightly steamed. All i had ever had before was either canned or cooked to death. Now it is a favorite. I also love Brussels sprouts. Roasting is my favorite way to fix them – i toss them with a little parmesan cheese & drizzle balsamic glaze on them. 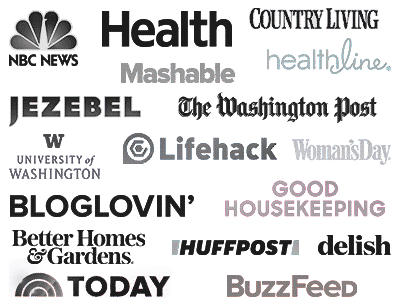 To die for…. I will have to try your recipe with the garlic powder. I think people don’t like brussels sprouts because they insist in boiling them to death in salted water, there is nothing worst than cooked sprouts (or broccoli) which you can mash with the fork. And that’s the way most people cook them, at least around here. Roasted are a 1000 better and this garlic version sounds delicious!